You know that awkward moment when someone asks you how you are and you tell them the raw honest truth. I blurted out how weary and exhausted and drained I feel. How I thought once all of my husband’s cancer treatment was done I’d feel better and how instead even my bones feel fatigued. There is a catch in my voice and tears waiting for me to blink them out as I answer. I could see the other person felt uncomfortable with my honesty, as I spoke, like they’d rather I kept my brokenness to myself. They looked at me like they wished I hadn’t let them see the cracks in my heart. Sometimes I like to put myself into bible verse, to pretend that the verse was written as a love letter to me. As I do this I remind myself that God isn’t uncomfortable with my unfinished, raw emotions. He doesn’t mind that when I utter what is on my heart I show I don’t have it all together, that I’m weak. God pours himself into the cracks in my life - not uncomfortable with my struggles - but not prepared to leave me there either. Ponder: Do you sometimes feel some of your emotions are too much for the people are around you? Have you tried to tell God how you feel? 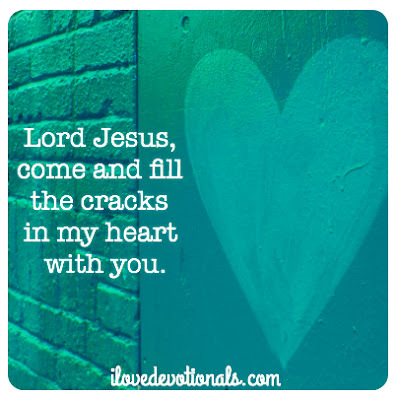 Prayer: Lord Jesus, come and fill the cracks in my heart with you. 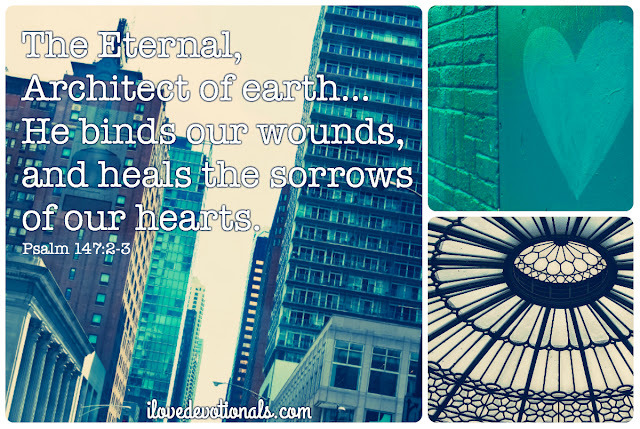 I need you to bind my wounds and heal the sorrows of my heart.